Greece made its Eurovision debut in 1974, and have participated since with exceptions in 1975 (in protest of Turkey’s particpation), 1982 (song was disqualified), 1984 (ERT believing the songs they received to be of “too low quality”), 1986 (date of the Contest clashed with a religious holiday), 1999 (due to relegation) and 2000 (due to financial reasons). They have won the Contest once. Greek interest in Eurovision has only been high since the turn of the century after a rapid improvement in results. Greece’s debut Eurovision entry was “Krasi, Thalassa Kai T’ Agori Mou” (performed by Marinella), which finished a middling 11th. They first broke the top 10 in 1977, with Paschalis, Marianna, Robert and Bessy finishing 5th with “Mathima Solfege”. It was then followed by two consecutive 8th place results in 1978 with “Charlie Chaplin” (performed by Tania Tsanaklidou), and 1979 with “Sokrati” (performed by Elpida). The 1980’s saw Greece score mainly middling results, with three top 10 results in 1981 with “Feggari Kalokerino” (performed by Yiannis Dimitras) finishing 8th, in 1987 with “Stop” (performed by Bang) finishing 10th, and in 1989 with “To Diko Sou Asteri” (performed by Mariana Efstratiou) finishing 9th. Greece had an equally middling set of results throughout the 1990’s, including two consecutive top 10 results in 1992 with “Olou Tou Kosmou I Elpida” (performed by Kleopatra) finishing 5th, and 1994 with “Ellada, Chora Tou Fotos” (performed by Katerina Garbi) finishing 9th. Their last appearance in the decade however saw them score their worst result to date, finishing 20th in 1998. Greece returned after a two year gap in 2001 where they got their first glimpse of an positive change in their Eurovision fortunes, when they finished 3rd with Swedish-based group Antique performing the song “(I Would) Die for You”. That upward turn was fully solidified in 2004 when local pop idol Sakis Rouvas came 3rd with “Shake It”, a result that started a chain of consecutive top 10 results for the rest of the decade. The following year in 2005, having earned an automatic place in the Final, former Antique lead singer Helena Paparizou represented Greece again with the ethno-pop song “My Number One”, and after a fairly even vote gave the Greeks their first (and so far only) victory. Their last appearance in the top 5 came in 2008, when they came 3rd with “Secret Combination” (performed by Kalomira). Greece’s run of consecutive top 10 results finally came to an end in 2012, when they finished a lowly 17th. 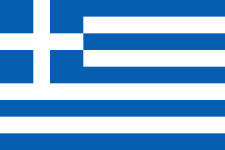 As of 2012, Greece have a perfect qualification record, even winning their Semi-final on two occasions in 2008 and 2011.